The following outlines package options for WNHealth.com. Page 2-3 details recommended packages. Pages 5-6 describes all other available services. Page 7 is a representation of the rating for the current website. Package A includes the absolute minimum to build and customize a basic website with your current content, doing triage on content to reduce pages from 40 to approximate 20, based on my research of other NMD websites (See appendix of comparative sites). SOJHA will bill WNHealth at a rate of $10/page or $59/hr, whichever is less for your convenience of budgeting. Content Editing and SEO Integration go hand in hand. Updating copy to make it current, easily readable, conversational, and including high ranking search terminology. This will ensure higher page rankings on Google searches. This also includes basic configuration of interlinking, tags, categories, and metatags. Call to Action includes multiple engagement points for visitors to contact and make appointments. This upgrade also tracks visitors to provide analytics which will help direct future design of the website to add/remove pages, expand information, and/or re-design navigation. Social Media Integration will be configured to automatically post new information from the website to primary social media links (FB, LinkedIn, Twitter, Google+, etc). You will also be able to post to your blog directly through a specially assigned email address. Basic Social Media Startup – Sets up proper business pages for 3 or 4 social media sites (FB, LinkedIn, Twitter, Google+, Pinterest, Instagram, etc). Without this line item, Social Media Integration is moot. Package B is an economy package for the bare minimum for a functional website. It provides a stepping stone to completing a truly professional website. SEO Integration includes basic configuration of tags, categories, and metatags. May include interlinking and basic key word listings. Package C is the best of all worlds. It includes everything from Package A to create a contemporary website which is truly branded and actively creates visitor engagement. With added functionality, brand presence, multiple media outlets, you begin to create a presence larger than a simple website with information on it. This is a Brand and Media manager for your business which just happens to include website design at this point. This VIP service is the gold standard for those professionals ready to be on the world stage. Through concerted effort in producing quality content, regularly engaging and building a fanbase, and using multiple outlets to gain brand recognition, this pathway builds the reputation of the client as a world class expert primed for large webinars and on stage presentations. Upon agreement and acknowledgement of work items to be performed, WNHealth agrees to a 25% deposit to be paid before work commences. SOJHA BS agrees to provide timely updates and detailed reporting on actions taken and time spent. Upon completion of agreed upon work, WNHealth agrees to pay remaining balance within 7 days. I hereby authorize SOJHA BS to begin executing tasks on the above marked project package. Check: Check payments can be picked up at your office. Credit Card: SOJHA BS can send you an electronic invoice you can submit a credit card payment online. The following options for the WNHealth website are described in detail with itemized costs. I have color coded items for simple prioritization. If you are ready now, simply send me an email listing the items you are ready to move forward on. I am excited to complete this project for you and re-launch your amazing new brand presence on the web. Red – Needs to happen. This is the basic website installation and migration of all your current content. Green – in the world of who’s who on the Internet, this is essential for being recognized. Blue – not an immediate need, but essential if you want to begin creating a global brand name. Content Includes installation of WordPress on customer’s server or SOJHA server. Hosting on SOJHA server is $99/year including domain renewal. Includes full content migration of text and images as well as applying uniform fonts and formatting. Will create simple and engaging navigation with menu and tags. The current WNHealth website has approximately 40 pages. You will receive a detailed manifest on each page migrated at the end of the project. Basic SEO ensures search engines like Google and Bing are able to read webpages. Without them, the Internet world does not know you exist. Currently, WNHealth.com is not showing up on basic Google searches for NMD Phoenix, naturopathic doctor Arizona, natural medicine, etc. Ongoing and advanced SEO billed at $59/hr and packages start at $750/mo. Bring your copy into 2015 – Editing copy for readability, interest, and engagement. Research the latest news articles and videos in support of your message. Grab contemporary images and optimize with proper alt-tags. Some references and featured videos date back to 2011. Install and configure active call to action. Visitors will be offered multiple pathways for contacting WNHealth and subscribing to the blog. Webpage tracking will be enabled to monitor page traffic. Information can be used to modify, delete, or expand pages based on visitor interest. This isn’t just buttons on a page. This is an all encompassing website function which will automatically post to FaceBook, Twitter, LinkedIn, and other social services automatically whenever you create a new blog post or website page. This also includes functionality to write new posts to your blog via email from your computer or phone. Currently, FaceBook, LinkedIn, and Google+ are set up incorrectly and not fully configured on the website. These can be confusing services to use and I will do my utmost to rectify appropriate pathways to connect with WNHealth. Update logo and photos on all pages. YELP is also recommended in this package. # of blog posts written for the website per week. Researching similar and complimentary websites and blogger and developing an online relationship to build interlinks. Boosting posts to reach a larger audience outside your fanbase…and first creating a fanbase. Email connection campaigns to build engagement with current patients. A clean updated look for your logo. A simple, cost effective logo can cost around $50-100. Using an expert in the field to create a world class logo and color palette is much more and can be arranged. You are a qualified speaker in the world of natural health and well being and the world should know. For every booked event, SOJHA will manage the details so you don’t have to. On the current WNHealth website is a knowledge base and forum. Integration of these two platforms must be assessed and quoted separately if desired. Currently there is zero traffic on the forum and undetermined traffic on the knowledge base. The knowledge base can be substituted for a simple links page or a glossary which may be more economical and feasible given what your intentions may be for having them. Simply inform SOJHA BS as to your intentions and I will create a new S.O.W. for this project. 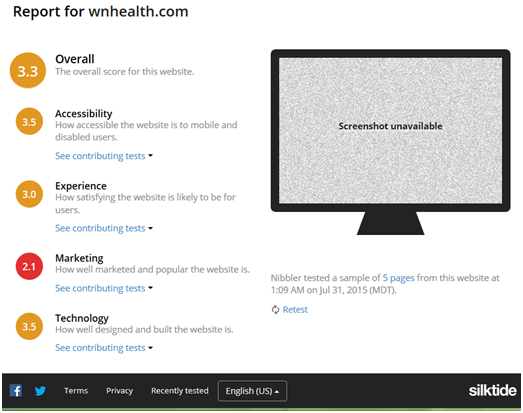 Current website score for WNHealth.com is 3.3 out of 10. Websites I have most recently built are scoring around 8 and increase every day.